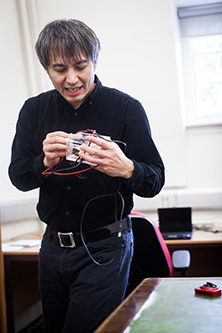 For several years I have been working on haptics - ways that people can produce touch through the internet. I have created hugging suits for parents and children, for instance, to embrace and hug each other at night time. What I want to do now is to try to make something that is small and very mobile with commercial applications. My haptic ring device, is another example. The basic idea is that we can now communicate through touch - physical touch rather than just text and audio visual means. Basically I can squeeze my ring and the person I am communicating with will also feel a squeeze on his finger. The other person, who is in another location, will see his ring light up and I will also feel a squeezed sensation in my finger. In this way we are bringing emotional and touch communication to mobile devices.